Quest Once a Day - Sunshine D - Vitamin D3 helps support general wellbeing, immunity and bone health. microcrystalline cellulose, di-calcium phosphate, vitamin d3 (with arabic gum, tocopherol, tri-calcium phosphate), croscarmellose sodium, anti caking agent: silicom dioxide, magnesium stearate. 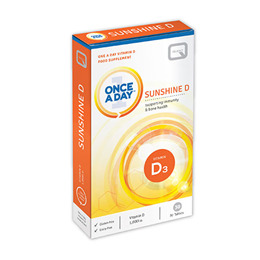 Below are reviews of Once a Day - Sunshine D - Vitamin D3 - 30 Tablets by bodykind customers. If you have tried this product we'd love to hear what you think so please leave a review.